The second instalment in the Divergent series (the one that’s not The Hunger Games or The Maze Runner, in case you get confused) is an odd little beast. Kicking on right from where we left off, Insurgent sees Tris (Woodley) lying low in an Amity camp (the peaceful faction in this dystopian society walled off from the rest of the world), before being smoked out by traitorous Dauntless and drawn back into a head-on fight with Jeanine (Winslet), the leader of Erudite and their alliance with Dauntless, who’s busy using Divergents (those who fit every faction) in an attempt to open a mysterious box left by the founders. Now Divergent wasn’t, let’s be honest, a great film. Despite all of its attempts to set up a story with urgency and high stakes, there was a distinct lack of narrative direction. For the first two-thirds, as Tris fumbled around Dauntless training facilities trying to fit in, it was hard not to just stop and ask why. Where is this going? Why are we investing our time in these characters? Where The Hunger Games was working towards something big with relatable character motives and emotional baggage, Divergent was flat, aimless and ultimately inconsequential. 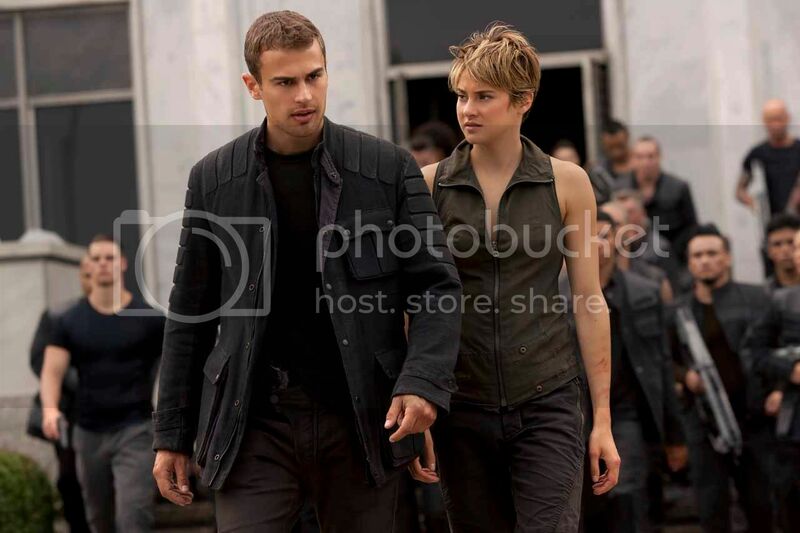 The problem is solved to some extent in Insurgent, with there being more of an immediate cause and threat, and an actual tangible goal for the central characters (Tris actively seeking out Jeanine to stop her from murdering any more innocent people; the intrigue of what will happen when or if the box is opened), but it still fails to yield anything like as interesting as the Hunger Games – or even a venture into a treacherous maze. Perhaps a bigger problem, though, is that when you look closely, none of it really makes sense. The whole thing bangs and crashes along at 100mph, and only when it slows down for a moment do we begin to realise that, actually, it’s all very higgledy-piggledy. Plot-lines are stretched and ragged, characters ill-defined and arbitrary, and action sequences all too eagerly shoehorned in – the whole scene on the train, for example, makes no sense. Why does Four (James) let a massive brawl start when he knew he could end it by telling the attackers his name? Some good performances do the film enormous favours, on several occasions elevating it to perhaps greater heights than it would other reach. Miles Teller, so impressive in Whiplash, is enjoyably loquacious, while Ansel Elgort, in a significantly larger role that last time (but still fairly small) continues to be an impressive and likeable screen presence. Shailene Woodley just has the misfortune of landing a role that would perhaps be more interesting if it wasn’t constantly coming up against Jennifer Lawrence’s Katniss – but she still figures out ways to do some engaging things with it. A scene involving her on trial trying to fight the influence of truth serum is the strongest in the film; a couple of teary minutes reminding us how good of an actress she really is. On top of that, Jai Courtney isn’t actually terrible! Who’da thunk it? To call Insurgent a bad film would be a bit unfair. It’s not rubbish, it’s just so meandering, so middle of the road. It never challenges its audience enough, and the occasional something of interest or morsel of fun is always offset by something dull and cluttered. To the same end, some of the set pieces are impressively constructed (Tris’ divergent dream trails are exhilarating), but the direction is often weirdly intrusive. All those crash zooms on faces make the actors look uncomfortable, like they’re being leered at. Ultimately, after two films, it still doesn’t feel like we’ve gotten anywhere. Something has drastically failed to click. It could be partly down to unavoidable comparisons with superior franchises, but is that really an excuse? At this rate, Mockingjay Part 2 can’t come soon enough.